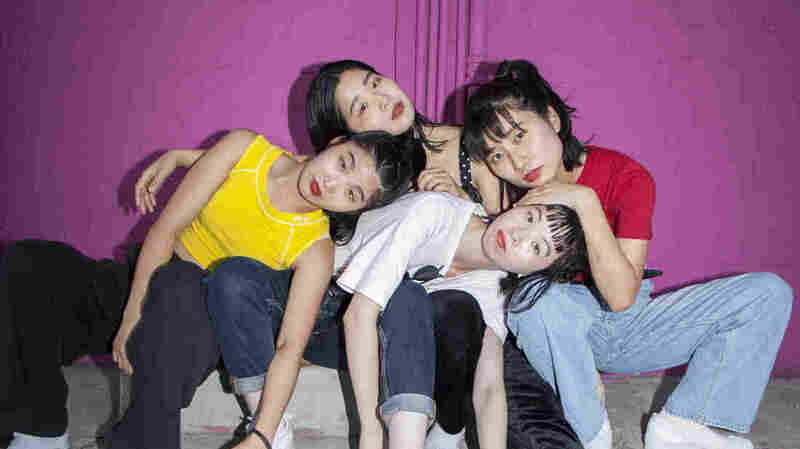 CHAI Undermines Worn Out Notions of Kawaii & 'PUNK' On Its Ebullient New Album The sugar-coated experimental pop band works to redefine and undermine the concept of "kawaii" — the pervasiveness of delicate cuteness in Japanese culture. 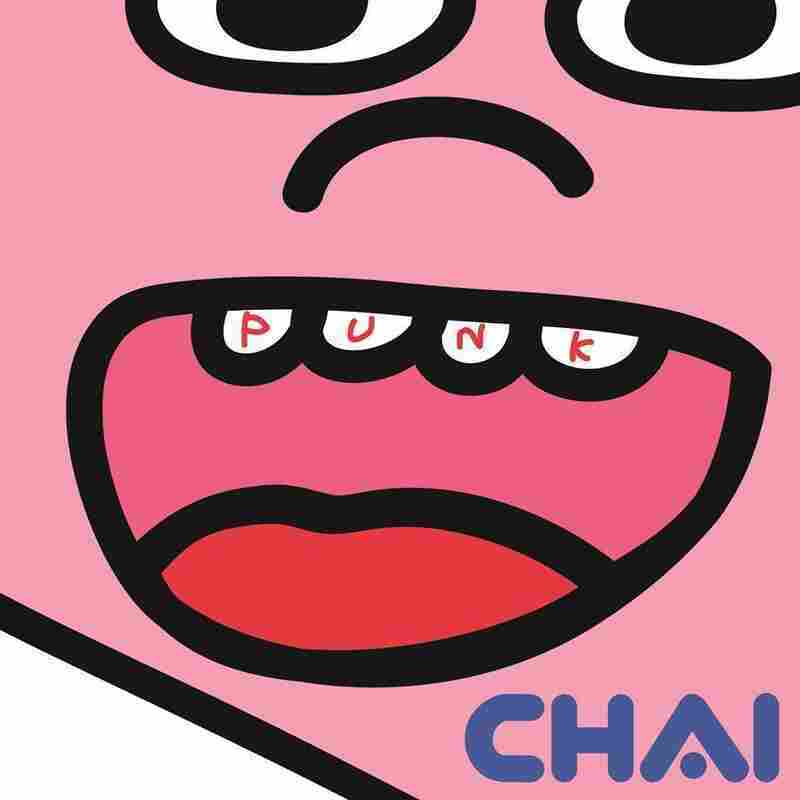 CHAI's PUNK is out March 15 on Burger. According to Google Trends, the world's view of Japanese culture is getting a whole lot cuter. In 2007, "Hello Kitty" rocketed above phrases like "samurai" and "geisha" for the most searched Japanese phrases — that is, until "kawaii" came along. The term, often described as a "delicate cuteness," may bring to mind a slew of pleasant images: emoticons, anime, smiling anthropomorphic creatures. In 2010, it started rising on the charts and, in recent years, even surpassed "Hello Kitty" itself. Once its commodification followed suit, the phrase turned into a staple of pop culture. But through the eyes of CHAI, a sugar-coated experimental pop band, "kawaii" is a reductive term. The Japanese group sees it as limiting and rigid, especially in terms of how measuring yourself against a specific promoted appearance can affect your self-worth. If anybody knows this downside to the term, it's them; all four members hail from Nagoya, Japan, and felt the pressure of "kawaii's" popularity firsthand. "There should be many more types of kawaii," reads a statement on the band's website. "We all have our own worries, but that's fine. Our insecurities make us who we are. The insecurities become art." Pre-order CHAI's PUNK on the Burger Records site and on iTunes. Main vocalist and keyboardist Mana, guitarist Kana, bassist Yuki and drummer Yuna have big goals when it comes to their music. If CHAI's breakout mini-album PINK aimed to introduce "NEO kawaii" — the group's revamped definition of "kawaii," which prioritizes inclusivity, comfort and self-love — to a larger audience, then PUNK wants to apply "NEO kawaii" to real life. The album kicks off with the enthusiastic anthem "CHOOSE GO!" Warped guitar and fuzzed-out bass soundtrack CHAI as its members sing about the importance of not letting anything hold you back in life. It's a bold burst of melodic rock, but just a hint of what's to come musically. From there, CHAI slips into dark new wave in "GREAT JOB" and try an indie-rock ballad with "Wintime." Even the electro-swing rallying cry "THIS IS CHAI" suits it well. In interviews, CHAI credits a surprising list of influences — Tom Tom Club, Tune-Yards and Basement Jaxx come up often — which, if nothing else, highlights how each member's individuality helps push pop's limits. Lessons of self-empowerment keep the album tied together. "Curly Adventure" shuns westernized hair products, "I'm Me" positions self-acceptance as a form of rebellion and "Fashionista" confronts the beauty industry. Every choice CHAI makes rings authentic, whether they're nodding to The Who in a music video or writing optimistic math equations for "Feel The BEAT" (a graphic on the band's website reads, "Positive + negative = POGATIVE"). There's realism in the band's lyrics, too, as they don't ignore the transitory periods of life, ultimately encouraging listeners to be gentle with themselves as their looks, interests and feelings develop over time. Through the course of the album, a feeling of unity rises to the top of an otherwise varied listen. It's possible that it stems from how tight the four are as musicians, or from how close they are as friends. For starters, Mana and Kana are identical twins. Yuna, whom the two befriended at their school's music club, suggested they stay in touch after she moved away, strengthening the group's ties. Then Yuki entered the picture with a figurative paint palette in tow, picking up the additional role of managing the band's visual output and, in turn, figuring out how to characterize their strengths and differences. Ever since CHAI formed in 2015, its members have been each other's biggest cheerleaders — which may be why every cheer for body positivity on PUNK sounds like it's being said with pom-poms in hand. If the explosion of self-care (and its eventual monetization) taught us anything, it's that putting yourself first isn't as selfish as it seems. CHAI takes that notion and builds a more meaningful message atop it: "Whatever I chose / It's me." It's why the members of CHAI sound worry-free while crafting a yearbook's worth of affirmations in these songs. When you learn your self-worth and resist the urge to pick apart your flaws, it feels as if a weight has lifted. PUNK replicates this feeling while still giving listeners a reason to dance — ultimately proving that cuteness takes many shapes, in image and sound, after all.